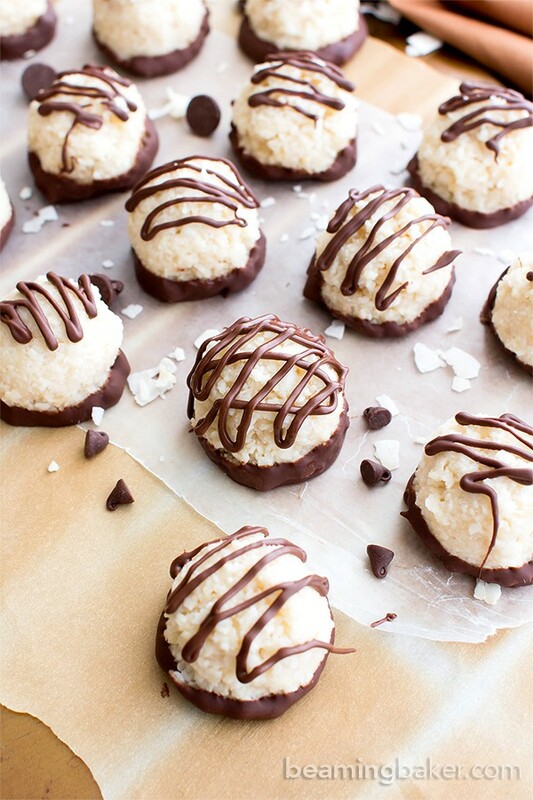 Vegan Coconut Truffles – Paleo Chocolate Coconut Balls! This gluten free dairy-free truffles recipe is easy, made with 4 ingredients! It’s the best paleo coconut balls – dipped in chocolate, healthy, whole ingredients. Refined Sugar-Free. Coconut balls to the walls? 😉 Okay, I’ll stop now. Back on point, if there were some kind of official-official post/representative position for Biggest Coconut Lover Ambassador in the World or something, my mom would be first in line—she inspired these delicious paleo chocolate coconut bars. ???? Did I ever tell you, the first time I foolishly took out a jar of coconut oil in front of my mom (in the midst of paleo baking, of course), she was like, WHAT IS THAT? Can I taste it? Smells like coconut!!! Gimmeeeeeeeee!!! Naturally, she tasted it, prematurely claimed it was amazing, then spat it out like I had cursed her and asked WHY it wasn’t sweet like coconuts. Or tasty like her favorite paleo coconut macaroons. 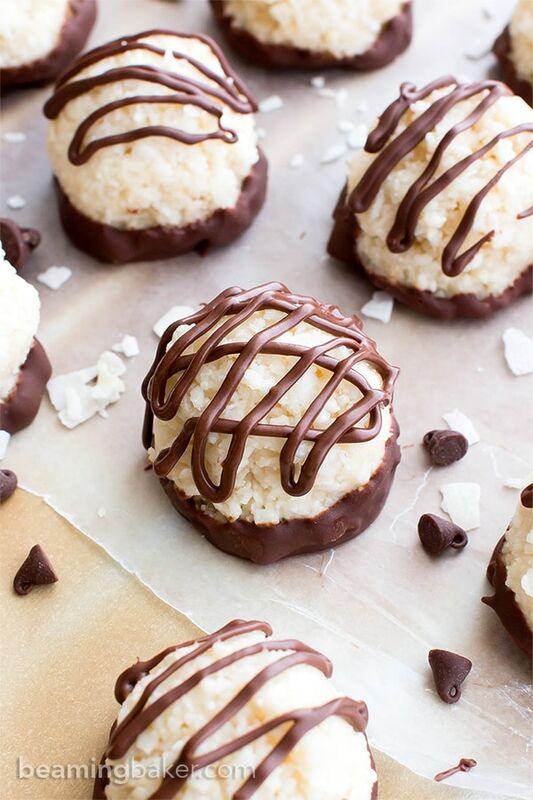 Today, I’m dedicating this vegan coconut truffles recipe to my paleo coconut balls-crazy momma. Upon ever-so-carefully taste-testing this recipe, she claimed it was the BEST gluten free dairy free truffles she’d ever had. And, I mean, the woman’s clearly got good taste. Check out the rest of my recipe post for substitutions notes, storing instructions and more for these paleo vegan coconut truffles! Enjoy. 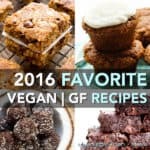 Vegan Coconut Truffles – My Fave Gluten Free Dairy Free Truffles! These paleo vegan coconut truffles are my favorite easy recipe to make as a gift (for others or… myself hehe). 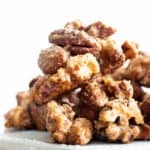 They’re made with simple, whole and healthy ingredients, fairly quick to make, and a favorite amongst gluten free dairy free truffles lovers. 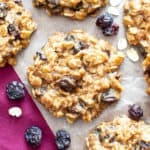 Another vegan paleo coconut fave: these chewy paleo coconut cookies! To make these paleo coconut balls… toss coconut flakes, coconut oil and maple syrup into a food processor. Blend until sticky and well-mixed. Scoop and drop tightly-packed balls of coconut mixture onto a prepared baking sheet. Chill in the freezer for about 15 minutes. 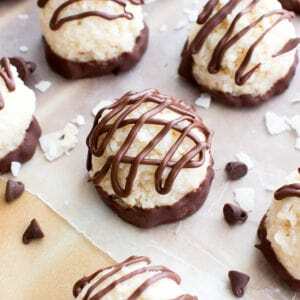 Dip and drizzle vegan coconut truffles in melted paleo vegan chocolate. Allow chocolate to set and enjoy! Also.. try this yummy paleo chocolate truffles recipe. Or these these paleo chocolate coconut bars. Store your gluten free dairy-free coconut truffles in an airtight container at room temperature, out of direct sunlight for up to 2 weeks. To freeze, store in a freezer-friendly container for up to 1 month—just remember to thaw the paleo coconut balls before enjoying. Also try my Paleo Almond Joy, it’s incredible! 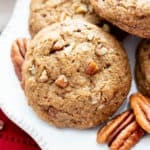 Coconut Oil: Unfortunately, I haven’t yet found a suitable substitute for coconut oil for the vegan coconut truffles mixture in this recipe. However, you can leave out the coconut oil in the chocolate dip and drizzle. Maple Syrup: try brown rice syrup, agave or honey (if not vegan). 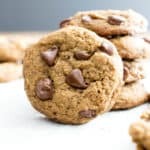 Vegan Chocolate Chips: sub with chopped paleo chocolate or even vegan white chocolate. 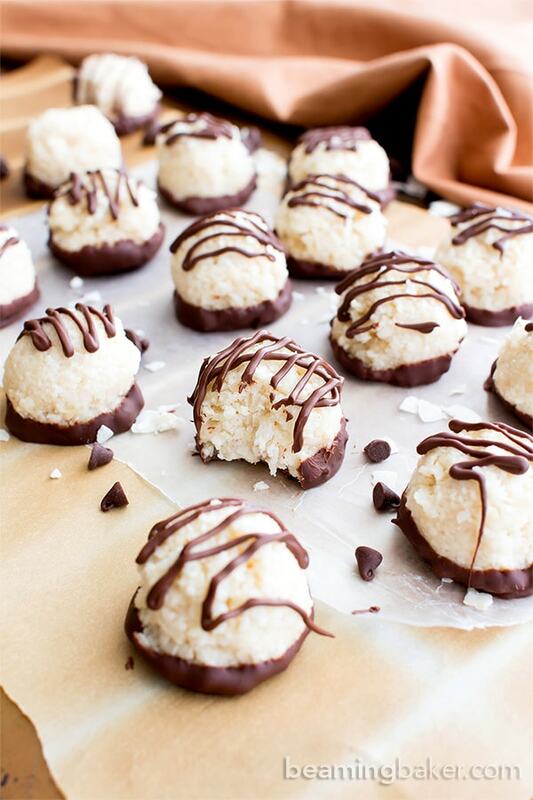 Vegan Coconut Truffles – Paleo Chocolate Coconut Balls! This gluten free dairy-free truffles recipe is easy! 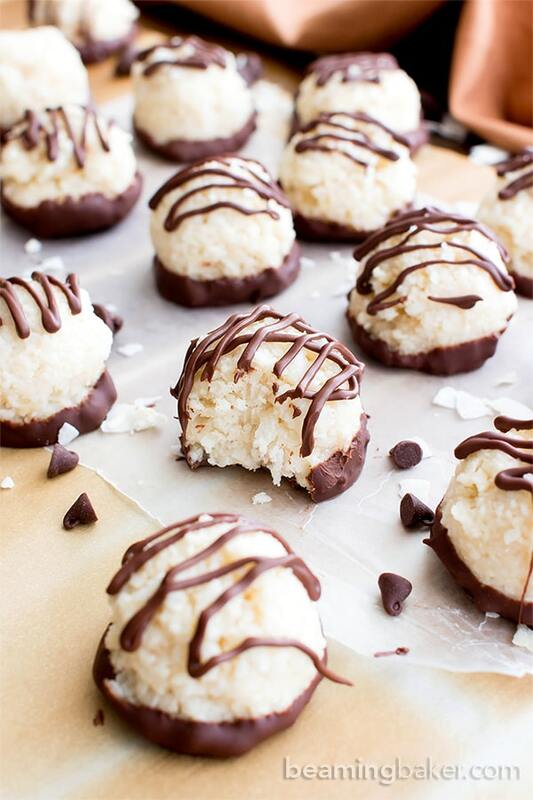 It’s the best 4-ingredient paleo coconut balls – dipped in chocolate, healthy. Make the coconut balls: Add coconut, coconut oil and maple syrup to a blender or food processor. Blend until you get a wet and sticky mixture, with smaller, but still noticeable coconut pieces. Using a small cookie scoop, scoop very tightly-packed balls of coconut mixture onto the prepared baking sheet, spacing them evenly apart. If needed, gently press and shape loose bits of mixture into a firm ball. Repeat until no mixture remains. 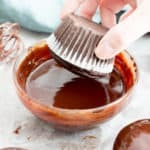 Make the Chocolate Dip Layer: Use the double boiler method, or the following. In a medium, microwave-safe bowl, add the Chocolate Dip Layer ingredients: add ¼ cup + 2 tablespoons chocolate chips and ½ teaspoon coconut oil. Heat in 20-second increments until just slightly softened and melted. Stir in between heating, until smooth. Remove coconut balls from the freezer. Dip the bottom of one ball into the bowl of melted chocolate, using the side of the bowl to scrape off excess. Lay back onto the baking sheet. Repeat until all coconut balls have been coated. Make the chocolate drizzle: add Chocolate Drizzle ingredients to the bowl of leftover melted chocolate. Heat in the microwave in 20-second increments until just softened. Stir until smooth. Using a rubber spatula, scrape melted chocolate into a zip bag, then trim a tiny corner off. Holding the bag over a coconut ball, pipe the chocolate in a zigzag pattern. Repeat for all balls. If you love these easy coconut truffles, you must try my Paleo Almond Joy or my Paleo Vegan Coconut Macaroons. - Store in an airtight container at room temperature for 1 week. Or, store in the refrigerator for up to 2 weeks. - If freezing, store in an airtight, freezer-friendly container for up to 1 month. Allow to thaw for 15 minutes before enjoying. - Nutrition Info is an estimation based on 15 total truffles made for this recipe. Tools to Make Vegan Coconut Truffles (Vegan) – Gluten Free Coconut Balls! Click the links below to check out my favorite tools & ingredients used to make this paleo vegan coconut truffles recipe. Paleo Vegan Chocolate – SUCH an amazing chocolate! Bar none. Hehe. 😉 It’s made with coconut sugar, paleo, dairy-free, vegan, and gluten-free. Woohoo! 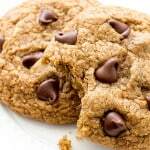 Vegan Chocolate Chips – a super popular, allergy-friendly brand of vegan chocolate chips. Small Cookie Scoop – Great for tightly-packed paleo coconut balls! Coconut Oil – the paleo vegan baker’s (and candy-maker’s) essential. I bet your mom is in love with these paleo truffles, Demeter! They’re just GORGEOUS! And what a wonderful holiday treat, too. I can only imagine receiving a tin of these for Christmas…wowsers! And that’s so funny about the coconut trees, or should I say palm trees? 🙂 Our neighbor has an apple tree and my husband and I always talk about picking a few, which we might, next year. Seeing as we just moved in not too long ago, we don’t want to make ourselves known as the bad guys haha. Pinning these beauties, of course! Hope you have a wonderful week! So good! Like a coconut macaroon which I LOVEEE! Yep! Speaking of which, I’ve GOT to start working on a macaroon recipe! Hehe. My mom would just love that! Thanks Rebecca! Haha, Demeter free coconuts are always better than regular coconuts! Your mom is such a hoot! My mom used to do that with flowers – and I mean do – not try to, or talk us into doing it. We’d be walking by a patch of daisies or roses and before you knew it – one or 5 would be in my mom’s hands! Your sister Jenny sounds like such a great daughter. That was so sweet of her to collect those coconuts for your mom! Your mom must have been so happy! Oh how I love it when you go all dialogue and detailed story-telling on us???? Hehe this is such a cute one. If only you could scale palm trees with your bare hands, then you would for sure be favorite daughter. But I don’t know, dedicating a whole delicious post to your dear mama gives Jenny some tough competition I’d say. I’ve seen those coconut climbing people, it’s crazy cool how easy they make it look! 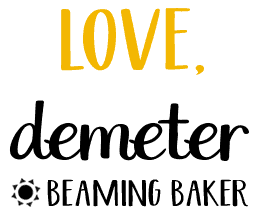 “Beaming Candymaker”–I think you should just switch URLs for the month of December because you have some mad candy-making chocolate-coating skills…plus it just has a lovely ring to it and wouldn’t be at all difficult/confusing to do ha! These look totally scrumdiliumptious, it has been much too long since my last batch of homemade truffles. So I’m going to go take a nap now, and when I wake up I expected to be covered in Chocolate Coconut Truffles, kay????? Your mom sounds like a real hoot. I bet she and I would be great friends 🙂 I love the coconut story, too. My sisters and I once cheerleader-lifted my sister Kim’s boyfriend so he could grab a “free” coconut while we were in Florida. It almost hit us all on the head, so I suppose that was karma’s best attempt at telling us those “free” coconuts are not to be messed with. P.S. 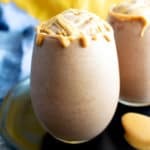 these truffles look so delicious and I love how simple they are to make! What could be better?! 1: Haha. Yep, candy making can be a pain if there are too many tools involved. 😉 2: Aw, thanks so much, Joyce! 🙂 Oh gosh, my mom would love those communities! Do you think they’re taking any new citizens? Haha. Thanks for sharing that! I like the look of these truffles. It´s amazing that it has only 4 ingredients. So yummy, It’ll be a perfect dessert for my tea break in the afternoon. Thanks so much for this recipe! 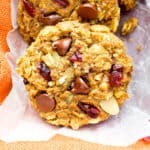 Just wondering if you’ve tried to bake these just for a little bit to give the coconut a toasted flavor?? I made these today, total hit! Soooo yam, Thanks for sharing the recipe. PS. Even my picky boyfriend liked them! OMG!!! My nieces and I just made these. ???????????????????? Oh yeah!! 🙂 🙂 What a fun activity to do together! Terry, I’m so happy that you enjoyed them.???? ???? Is there a different sugar to use to make it sugar free? Xylitol? Erythritol? Stevia? My sister and I really want to make these. We are both on strict diet due to health issues and need to know the nutritional​ information on these truffles please. Thank you. Amazing. Thank you so much for a quick response. I’m planing on making them this weekend. Have a blessed day. My pleasure! Have a blessed day. 🙂 P.S. Can’t wait to hear what you think! They were an absolute hit at my annual tea. Everyone loved them! I love the Mounds candy bar, so I had to try making these! I thought the taste was good, but I had to make adjustments after the first batch turned flat as a pancake. I think the amount of solid coconut oil was too much. On the second batch, I used 2 Tbs. instead, added a little more almond flour, and baked @325 degrees and they looked a lot better. Still not as much of a mound as your picture shows. They were easy to make and not much of a mess was left to clean up. That was a plus! Hi Judy! Could your comment be for my paleo coconut macaroons? If so, did you use large flaked coconut or small flaked coconut (about the size of a grain of rice)? Using large flakes will result in flat cookies. Glad you enjoyed them! These were delicious! I used date syrup which made my truffles have a pinkish tint. 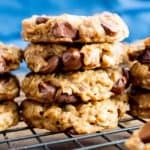 This reminds me of a mounds candy bar, just healthier! Woohoo!! I’m so happy to hear that you loved it, Lisa! Date syrup sounds amazing in this!